I was disappointed (okay, angry) to read an interview with Aleksandar Hemon in the March/April 2011 Writer’s Chronicle. Here was yet another fiction writer (or critic) berating the memoir as if it’s unseemly to explore the human condition. What I didn’t say to Mr. Hemon, in my Letter to the Editor, is that to write a memoir is not a simple act of regurgitation or spitting out facts to an “interesting story” along the lines of “first this happened to me, then this happened, then this next thing happened.” Of much greater interest, and at the heart of memoir, is the story behind the story, the memoirist’s courageous ability to reflect upon the past, thus artistically recasting his or her experience into one that’s transformative. Sue William Silverman’s memoirLove Sick: One Woman’s Journey through Sexual Addiction (W. W. Norton) is also a Lifetime Television original movie. 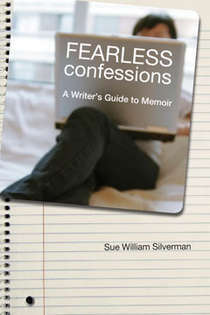 Her first memoir, Because I Remember Terror, Father, I Remember You, won the Association of Writers and Writing Programs award series in creative nonfiction, and her craft book is Fearless Confessions: A Writer’s Guide to Memoir. She teaches in the MFA in Writing program at Vermont College of Fine Arts (www.suewilliamsilverman.com). Yes Sue, memoirists seem to be misunderstood quite often. Apparently telling the deep and often dark truths about the human condition is upsetting to some, perhaps many. But for many more–the writers of memoir and their readers–a memoir offers hope, compassion, and meaning. A memoir teaches us about joy as well as suffering, how to suffer and recover, that we are all imperfect. This amazing grass roots movement of memoir is about something important or people wouldn’t be drawn to it. Thank you for your books and your wisdom and guidance and being a voice for the power of memoir! And Dinty, I’m so glad you will be with us at NAMW for the Teleconference on Memoir and Creative Nonfiction on Oct. 21. Bravo to you both. Is it really true that some fiction writers are content to only populate our culture with characters who are invented by themselves? It seems the height of narcissism! I paraphrase Cyrano De Bergerac. Instead of “Bring me giants,” I say “Bring me people.” Sue William Silverman’s dark memoir “I Remember Terror Father, Because I Remember You” is a great example of a book populated by the unbelievably messy human conditions. I appreciated learning about her real experience.Thanks to her for her memoir, for this defense of the craft, and to Dinty for providing this forum. I never understood this argument, this visceral reaction, the negative response over memoirs and those who write them. I guess it’s easy to criticize what you don’t know – ignorance breeding arrogance. Yes, there is bad memoir, but there is also bad fiction and there are bad novels. It takes good writing, keen insight, superb guts to write a memoir that resonates with the reader and is not a list of quirks, regrets, and sorrows. That’s far easier to write about. It’s the stuff below the skin, the dirt under the fingernails that reveals the great stories inside all those life stories. Thanks, Dinty, for telling it straight. Don’t fiction writers get their inspiration from reality? I’ve read many novels and stories that are (often in the author’s own words) “loosely based” on their own experiences (Jhumpa Lahiri and Junot Diaz, for example). I’m not sure where there’s such hostility–to me, it’s two different sides of the same coin, two different iterations of the same impulse. There aren’t enough readers and book-buyers to begin with. Let’s please support each other. The same “cowardly” argument can be made if the tables are turned. There is much more safety in fabricating a story where the author’s stakes rest only on his craft. Critique of the craft does not cut into the author’s very life and soul. You don’t brace yourself for questions and cutting remarks about who you are and the life you’ve lead, the way a person who shares a part of his life through memoir has to brace himself for scrutiny. Maybe the allure or popularity of memoirs is that we have a population of readers who want to read about the human condition in a time when we’ve all become a commodity of sorts. There is a visceral connection readers get when they know they are reading a true account as opposed to a fictional account. I say this hostility only bodes well for memoirists. We’ve touched upon a nerve, we’ve threatened someone’s sense of security or superiority. That means we’re doing something right. I find this strange coming from Hemon. How does his recent memoir/non-fiction piece in a June New Yorker magazine about the terrible death of his baby daughter figure into all of this? The writing was stark and beautiful and immensely powerful — I’m disappointed to think that he trashed memoir elsewhere. My sentiments exactly. How does Hemon reconcile his piece in the New Yorker with his statements in Writer’s Chronicle? The fiction comes from somewhere, and if it’s not connected to someone’s experience, if the writer cannot connect it with his experience, his feelings, his hopes, his very being, then he’s probably a hack, borrowing from what he’s read, not what he knows. What great novels are not taken from experience, and what great memoirs do not transform mere documentation into a narrative, hence, if you must, a kind of “fiction.” Alas, the terms are useless. I come from a family of secrets. I thought I wrote memoir because my grandfather was a journalist, that nonfiction was simply “in the blood.” The truth is I write nonfiction because telling the truth–refusing to keep secrets–feels more powerful than anything I’ve ever done. But this “airing of dirty laundry” makes my family uncomfortable. My mother periodically questions whether fiction would be more fun. Really? For whom? I suspect for her, as well as many hostile fiction writers, I’ve ventured too close to something dark, something that should remain unspoken, unwritten. If a story is fiction, we can muck around with difficult subjects because it’s safe. We all know it didn’t really happen. The problem with memoir is that it DID happen, and once that story is loose in the world there’s no telling what it will stir up. Or perhaps the hostility is the unfortunate result of a perception that the publishing pie is shrinking. Novelists don’t want to share their dwindling slice with an upstart genre that doesn’t (fill in the blank). They tear memoir down in order to feel better about themselves. Personally, I’d rather spend time completing my memoir. Thanks, Dinty, for yet another throught provoking post. Give me a TRUE story any time. Much rather hear from someone who has ‘been there, done that’. How well they tell their story shows craft. As we are all human, it is a reminder that anything human, we are capable of–thanks Maya Angelou for that insight. It has to be ‘fun’ to make stuff up and takes skill to keep your reader interested but CNP is where life is at. My reaction: would an editor ever, ever say that about fiction? Or even non-fiction? Given the popularity of memoirs – as one of the comments here mentions, I am mystified by this ongoing reluctance on the part of publishers and editors to embrace memoirs. I’m sure I’m not alone in my preference for reading good, confessional memoirs over watching reality TV. There’s a huge audience out there waiting to read good memoirs. Here’s my theory about why literary people get memoired-out. They started out reading literature, being more interested in imaginary people than real ones. We memoir junkies, on the other hand, set our priorities somewhat differently, loving the way real life can be described in a story. If this trend continues, we real-people will gravitate to our own publishing world. This could not have happened when the literature people ruled the world, but now, in the internet age, anyone can form their own version of reality. Good defense, Sue. I want you on my side in any fight. And in case we memoirists are searching for a novelist who understands what the best memoirs accomplish, here is Hilary Mantel in the NYTimes today. I agree with Emily Rosen: it’s the writing, the prose that matters most. You are currently reading In Defense of Memoir: Once More Into the Fray at BREVITY's Nonfiction Blog.